Some of the football we played in our win against Newcastle last week was just amazing. Considering we didn't have a manager until a month before the season started, and that we have only been training together for two or three months, the team has settled in really quickly. His skill and tricks in training are just ridiculously good. He and Stevie Ireland are probably battling as to who has the best tricks and, if you put those two on the same team in training, then there is only one team that is going to win - I just demand to be on their side! 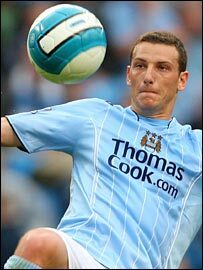 When I heard Elano was coming here I thought 'how the hell did we get him so quickly!?'. I knew he had great ability but he is not just a good player, he is a nice guy too. He is a feisty character off the pitch and he likes having a laugh. The rest of the players love him and he is someone we all want around the camp. He is not fluent in English yet but he still likes to get involved in banter with the boys and that is what I like about him. Sometimes it takes players a while to adjust to the Premier League but Elano has fitted in already and once he gets to know the league, the teams and the players he should get even better. Martin is a lively character as well, only he speaks a bit better English. Him, Elano and Geovanni are all the same - just jokers really. But once it is time to be serious on a Saturday they can do the business as well. I don't think many people have noticed how well Vedran and Javier have slotted in at full-back - it is like they have been playing here for years. Vedran is just like a Rolls Royce - he is so calm and never seems to break sweat. Jav knows what he is doing too. He is not a shy guy and he has fitted straight in. He chills with us before training but when he goes out at the weekend it is with his boys from Spain - Ivan Campo and the Alonso brothers, Mikel and Xabi. Roland is so composed in training. He has a great touch and great technique - a typical Italian really. He was a bit louder when Bernardo Corradi was here and has quietened down since he joined Parma on loan. He still mingles with the rest of the players but he was a bit disappointed when Corradi left because they used to go out for dinner and spend a lot of time together. Geo is always smiling even when he is not in our starting line-up. He is great because you know you can bring him on and he will get the party tricks out. He is not afraid to try things either. I haven't seen him since his injury, which was a real blow for him but, from what I saw before then, he will be a very good player for us when he is fit. You could give the ball to him in training and it would be 'one touch, two touch, three touch - goal!' What I liked most about him was that he knows where the net is. Gelson is like a smaller version of Patrick Vieira - he doesn't stop running and he puts his tackles in too. He speaks five languages, so he is an intelligent boy. He has got to be the cleverest player at the club, even more so than Nedum Onuoha. Whenever you want to know something you go to Ned - even when he is wrong it sounds impressive because he always sounds as though he knows what he is talking about. But with Gel here he has to make sure he gets things right.